China’s navy issued a warning to a U.S. P8-A Poseidon surveillance aircraft over disputed waters in the South China Sea. Foreign military aircraft. This is Chinese navy. You are approaching our military alert zone. Leave immediately. These are the words heard over a crackling radio in a new video posted by CNN this morning, one of at least eight warnings sent to a U.S. P8-A Poseidon surveillance aircraft by the Chinese navy. According to the report, the People’s Liberation Army-Navy’s warnings came as the P8-A flew over disputed islands in the South China Sea — specifically, over China’s man-made islands. The report notes that the source of these transmissions was a facility on “an island made by China some 600 miles from its coastline.” The report does not definitively specify which reclaimed reef hosted the facility, but it is implied in comments from the commander of the U.S. Pacific Command (PACOM) P8 fleet that the warning came from an early warning radar facility Fiery Cross Reef. The incident is reported to have occurred on May 20, 2015. Two matters stand out about this episode. First, the mere fact that we’re seeing this report and, better yet, watching video footage, is a sign that PACOM wants to be very open about this. By inviting a CNN reporter aboard the P8-A, the Pentagon clearly wanted the world to get the message that China is starting to assert its claims to these disputed territories. The report notes that this is the first time the U.S. Department of Defense has declassified video and audio of China’s island-building in the South China Sea and the Chinese navy’s warnings to the United States. The report is damning to earlier Chinese claims that China’s land reclamation activity had benign intentions, related to marine research, hydrography, and humanitarian rescue and disaster relief. The United States had already said it did not buy that justification for China’s reclamation activities, with one State Department spokesperson noting that the reclamation would not lead to peace and stability, “even if, as some Chinese officials have stated, the facilities in question were used for civilian disaster response purposes.” The United States is eager to have its perspective on China’s reclamation activities seen in the court of public opinion. The second implication of this incident is related to China’s plans for its claims in the South China Sea. If China is starting to warn low-flying aircraft against entering its “military alert zone” in airspace over its reclaimed islands, it could presage the formal pronouncement of a South China Sea air defense identification zone (ADIZ). In November 2014, China declared an ADIZ over the East China Sea, provoking the United States to fly unarmed B-52 bombers through the area. Recently, reports emerged that the United States would begin sending aircraft and ships to challenge Chinese claims in the South China Sea. The P8 incident shows that the Pentagon has already started doing this. CNN notes that former CIA Deputy Director Michael Morell cited the incident as an indicator that there is “absolutely” a risk of the United States and China going to war in the future. Indeed, the chances for a military incident between the U.S. and China are increasing in the South China Sea. 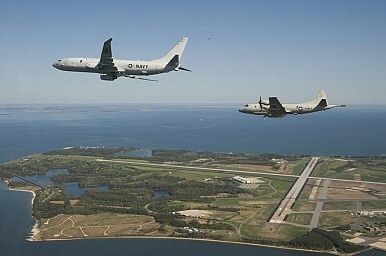 This latest episode with the P8 aircraft comes after the December 2013 USS Cowpens incident, and the August 2014 near-collision between a Chinese fighter and a U.S. P8. Morell’s caution may be well-placed. Should a repeat of something like the 2001 Hainan incident occur — when a U.S. EP-3E signals intelligence (SIGINT) aircraft collided with a Chinese J-8 fighter in mid-air, killing the Chinese pilot — the fallout could lead to a kinetic confrontation. As the U.S. plans to fly surveillance aircraft both lower and closer to China’s new facilities and potentially send its ships within 12 nautical miles of the man-made islands to show that they don’t enjoy “territorial water” status under international law, the potential for an altercation increases.